Did you know that Outlander has the most engaged fan base in advance of a premiere in Starz history? As you can imagine, that’s marketing gold to the powers that be. 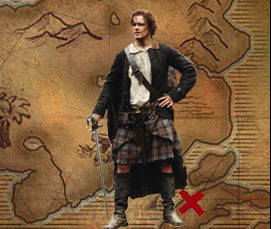 In fact, Starz’ Digital Marketing team has been working very hard to make us, the fans, feel like we’re ‘part of the ride,’ hoping it will motivate us to spread the news that the books are coming to life (as if we needed any coercion lol). They hosted the fan event in NYC in October 2013, and LA in January 2014. We had behind the scenes glimpses of video/sketches & artist renderings/Q&A with Ron Moore, Diana Gabaldon, AND the lucky attendees in LA also got to interact with Sam Heughan & Caitriona Balfe! The #PocketJamie campaign was designed as a digital extension of a fan event we held in Los Angeles. Attendees were given their very own #PocketJamie and challenged to take photos of him and upload them to Twitter. This activation will last over 2 months and will culminate in the #PocketJamie awards to be “held” in March. • Bring a piece of the Outlander fan event to those who could not attend by giving #PocketJamie away on Twitter and encouraging everyone to participate. The fun isn’t over yet. 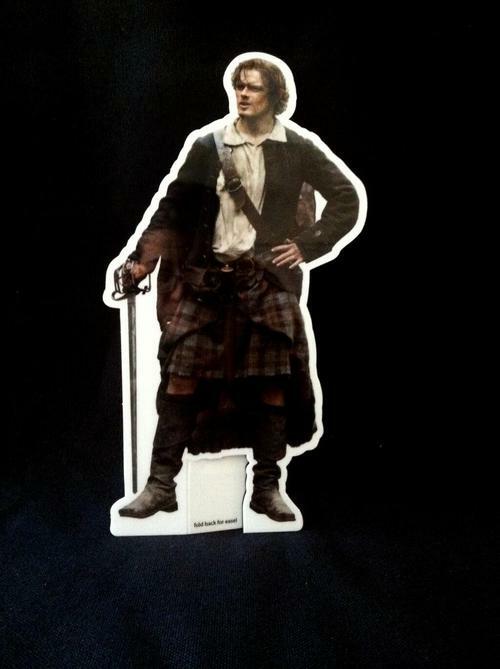 And for those participating in the #PocketJamie contest, good luck & have fun! I can’t wait to see the entries, lol. A Pocket Jamie a day keeps the redcoats away, ken?